Right hand rings have become very popular. 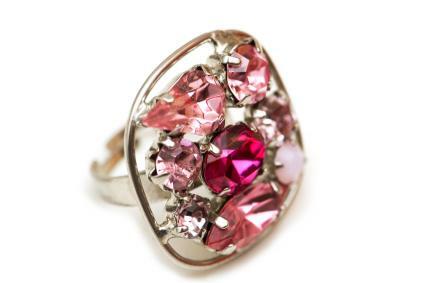 Originally known as dress rings, right-handers used to be worn only on significant occasions. Modern right hand jewelry, however, can be worn every day. Whether you receive one as a gift or purchase it yourself, this type of ring makes a great fashion statement. Some right hand rings are designed with all diamonds, but that is not the only option. 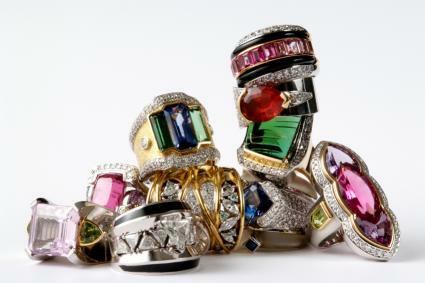 Many of these rings feature gemstones like sapphires, rubies, emeralds and amethysts paired with diamonds. Pyramid band: Pyramid-style rings are fairly thick, featuring multiple rows of stacked diamonds arching to a raised center. 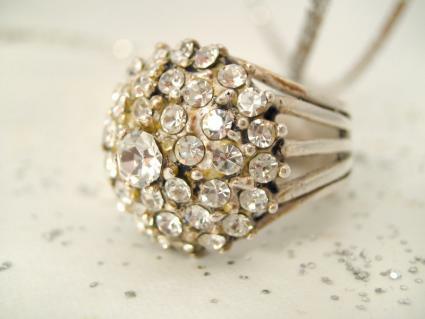 Gordon's Jeweler's carries a lovely pyramid style diamond cluster ring. It is a 3 carat total-weight ring and is priced at just under $2,600. For those who prefer a smaller ring, Zales carries a similarly designed 1 carat pyramid ring priced just under $600. Firenze Jewels has an interlocked chain style with 2.47 carat total weight priced at $3,890. Black and white diamond bands: A right hand band featuring a combination of black and white diamonds is a lovely choice for women who like simple yet sophisticated styles. Gordon's carries one in an ocean spray design and one crafted with an argyle pattern. Both rings are priced below $600. Filigree styles: If you are a fan of vintage-style jewelry, you may want to select a filigree design for your right hand ring. Sears carries a lovely hand-engraved filigree ring done in white gold and diamond ring from Alluerez. The ring feature .5 carats of small round diamonds set at the top and bottom, offsetting a lovely intricate hand-engraved scroll work design. This ring is priced at just under $1,275. 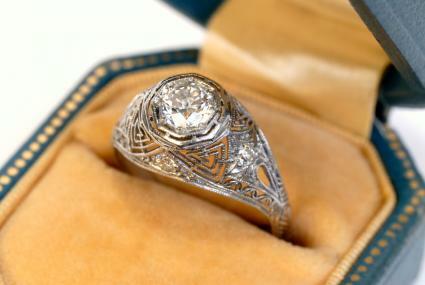 Moissanite also offers a selection of vintage-style filigree rings in a $400 to $1,900 price range. 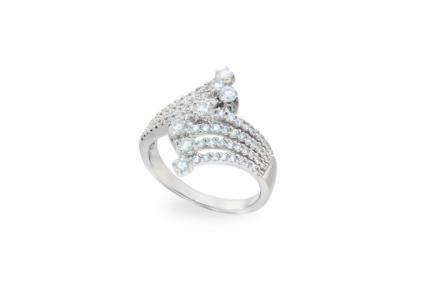 Ballerina ring: Featuring both baguette and round diamonds, ballerina rings are a great option for right hand rings. The 1 carat total weight ballerina cluster from Sam's club, priced just under $700, is an affordable option. Gemstone bands: Firenze Jewels carries fashionable gemstone and diamond bands in both sapphire and ruby styles priced at $2,200 each. Zales carries a nice emerald band that features three emeralds set side by side, with tiny diamonds framing the outer edges for under $400. Large center gemstone: Gemstone rings often feature large center stones surrounded by small diamonds. This lovely purple amethyst ring features a 1.23 carat round amethyst surrounded by round diamonds and mounted on a channel set diamond band from Firenze Jewels is priced at just over $2,000. Zales carries an impressive pear shaped emerald ring. The focal point is a 6 x 4 mm emerald surrounded by .14 total carat weight of small diamonds. Gemstone and diamond cluster: This ruby and diamond ring from Firenze Jewelers features a center cluster of .53 of a carat of princess-cut rubies surrounded by .12 of a carat of tiny round diamonds for $1,225. Zales offers a diamond and emerald flower cluster ring priced just over $1,100. The ring features .625 carats of small round diamonds surrounding a cluster of emeralds and embedded in the triple-shank band. Interesting shapes: Rings crafted in interesting shapes are great conversation pieces and fashion statements. This ruby lace bow ring from Trax NYC features 1 carat total weight of rubies forming the "loops" of a bow with .06 carat total weight of tiny diamonds forming the center knot. It is priced just under $650. This white sapphire and diamond bubble ring from Gilt is a contemporary choice ideal for anyone who likes sizeable rings. 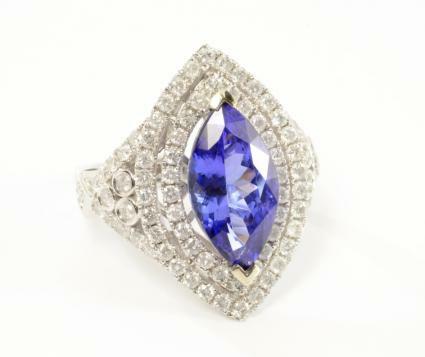 It features 13.8 carats of white sapphires paired with .96 total carat weight of diamonds and is priced at $4,890. Ross Simons: Ross Simons carries an extensive selection of upscale new and vintage estate rings designed for right-hand wear. Jared: Jared's selection includes very inexpensive options done in sterling silver through top-of-the-line diamond and gemstone selections. Joshua's Jewelry: If you like cocktail-style rings, Joshua's Jewelry has a number of choices in diamond and gemstone options. Overstock.com: Though the selection varies significantly from time to time, Overstock is a great resource for finding deeply discounted rings in a variety of styles. What is there to distinguish a right hand ring from a traditional engagement ring? In fact, there are many style differences that clearly demonstrate the differences between the two types of rings. Right hand rings frequently leave open space in the band design giving a free, spacious feel to the metal. Right hand styles do not typically have just one stone. Instead, many stones in a range of sizes are grouped together to create the design. Right hand rings are often arranged vertically along the length of the finger rather than encircling it with a narrower design. Right hand designs are not meant to be paired with enhancers, wraps, or bands. Women should care for their right hand rings just as they would care for an engagement ring. Do not wear the jewelry when performing heavy labor or sporting activities. Avoid contact with potentially corrosive chemicals and cleaning solvents. When not being worn, the ring should be stored in a soft bag or lined jewelry box where it will not contact other jewelry that may cause scratches. Periodic inspections and professional cleanings will help keep the ring looking its finest and can catch any potential problems before the damage is irreversible. With celebrities such as Julia Roberts, Cameron Diaz, Halle Berry, and Sarah Jessica Parker flaunting spectacular right hand rings, it is no surprise that this jewelry trend has exploded among independent and confident women. With virtually no limit to design options and choices to fit every budget, right hand rings are sure to continue growing in popularity.